The TackleDirect Offshore Popping Package contains lures from Ocean Tackle International, Shimano, Sting-o Fish and Yo-Zuri. 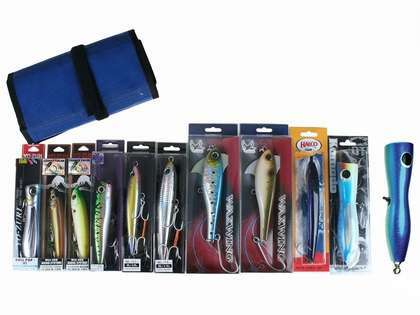 Two Nantucket Bound 6 pocket roll-up lure bags are also included. Only one storage bag arrived! Still no replacement sent 4 weeks later. Size difference off pluggs is large. Some heavy some light, if you have one rod in mined to cast with the lighter ones may not be best and will go into your Rock Fish bag!